While most of our Easter traditions center around my Italian roots, I enjoy the baking traditions of other areas of Europe, too. 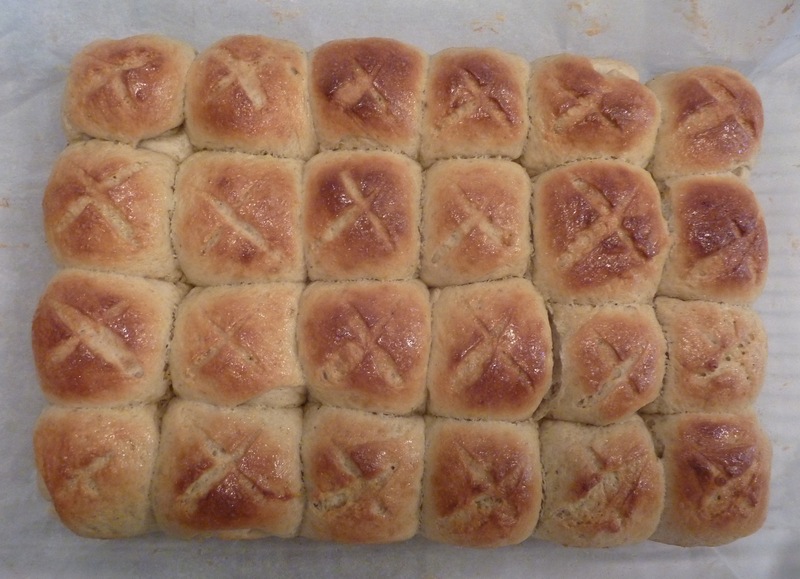 Last year I posted a Polish/Russian babka recipe and this year I’m posting sweet buns from the British Isles. I love bread baking and it brings me great pleasure to smell a yeasty, citrusy holiday loaf baking in the oven. The first time I ate a hot cross bun was in England more than twenty-five years ago. I noticed the buns for sale during the Easter season, and loved their moist texture and spicy flavor, so I was both surprised and disappointed to find that, when the holiday was over, they disappeared from the stores. They are traditionally eaten on Good Friday, and I make them ahead so we can have them for breakfast to usher in the holiday weekend. I tried quite a few recipes, attempting to reproduce the flavor I enjoyed in England, and finally came across a great recipe in The Gourmet Cookbook from which my own is adapted. I prefer to keep the buns simple, without dried or candied fruit, but feel free to add raisins or currants if it suits you. Also, the dough develops a better flavor if allowed to have an overnight rise in the refrigerator. I make the dough on the Wednesday evening of Easter week and chill it in the refrigerator overnight. 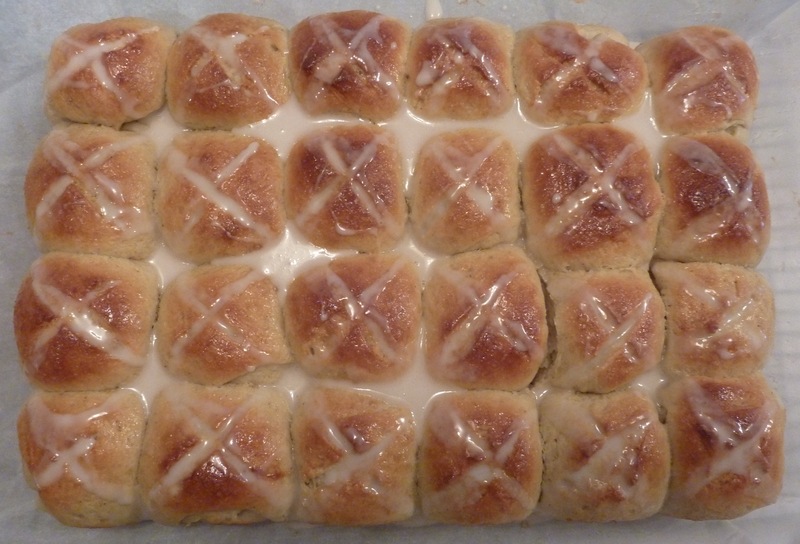 I bake the buns on Thursday, and we eat them for breakfast on Good Friday. In a small bowl mix warm milk, yeast, and 1 tsp. sugar. Cover with plastic wrap and let sit 5-10 minutes until foamy. In a separate bowl sift 4 cups flour with 1/2 c. sugar, spices, and salt. Cut butter and margarine into flour to form a coarse meal. In a small bowl beat 2 eggs and 1 yolk. Add zests and vanilla to the eggs. Form a well in the center of the flour mixture. Add yeast and egg mixture and bring together to form a dough. Turn dough out onto lightly floured surface and knead, adding flour as necessary to form a smooth, soft dough. Place in an oiled bowl, cover with plastic wrap, and chill overnight in the refrigerator or, if baking the same day, let rise 1-1/2 hours until doubled. If using the overnight method, let the dough come to room temperature for 1 hour before shaping for the second rise. Divide dough in half and roll each half into a log. Cut each log into 12 pieces. Roll pieces into balls. You should have 24 balls. Grease a 9×13 pan and line with parchment paper. Place balls close together in the pan. Cover with a kitchen towel and let rise 1 hour. Take a sharp knife and slash an X or cross on top of the buns. Combine the egg and sugar for the egg wash and brush it on the buns. Bake at 350 degrees for 15-20 minutes until golden. Take out of oven and remove buns from the pan by lifting out the parchment paper onto a rack. Let cool. For the icing: combine the sugar, butter, 1 Tbsp. milk, and vanilla and whisk until smooth but slightly thick. You may need to add more milk. Spoon the icing onto the slash marks. Let icing dry, then serve. Makes 24 buns. This entry was posted in Breads, Breakfast, Easter. Bookmark the permalink.